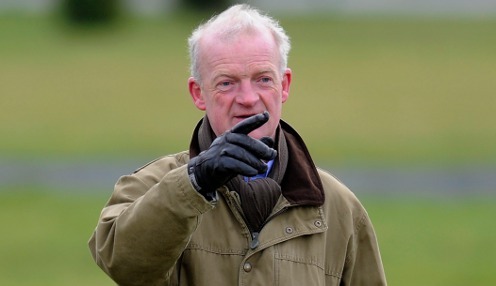 Leading jumps trainer Willie Mullins aims a volley of runners at the prestigious Cesarewitch Handicap (15:40) at Newmarket on Saturday afternoon. A field of 33 are set to tackle the two-miles and two-furlongs trip, spanning two counties and finishing on the iconic Rowley Mile at Flat-racing's Headquarters. Mullins, champion jumps trainer in Ireland, aims no less than seven runners at the prize, with Stratum, Limini, Law Girl, Uradel, Low Sun, Whiskey Sour and Meri Devie all in the mix. Stratum was a well-backed favourite for York's Ebor in August, though he got a poor draw and suffered traffic problems that derailed his hopes on the Knavesmire. He is a 6/1 chance to win the Cesarewitch and, given a fair rub of the green, his trainer has high hopes. We'd be expecting him to bring home some sterling. "Stratum was very unlucky in the Ebor. From a poor draw he got no luck in running and it just didn't work out for him on the day," said Mullins. "He was very impressive in Newbury the time before that and he's working as well as he's ever worked at the moment. Granted normal luck in running we'd be expecting him to bring home some sterling." Former Cheltenham Festival winner Limini defeated stablemate Law Girl to win a decent handicap at Leopardstown last month. Mullins wasn't overly excited by the display, though he knows Limini might improve stepping up in distance. The Rich Ricci-owned duo are given a chance. "It was great to see Limini pick up a big handicap after hitting the crossbar twice in Galway, but to be honest, I was slightly disappointed that she could only beat Law Girl by a small margin," he added. "That performance would suggest that she doesn't have much in hand over the handicapper, but it could be the extra couple of furlongs brings about a bit more improvement. Law Girl ran well behind Limini, she has a nice racing weight with less than 9st on her back she has an each-way chance." Limini is 12/1 to win the Cesarewitch, while Law Girl is a 25/1 chance to take out £307k first prize. Stars Over The Sea ran away with a C & D trial at Newmarket last month and has Jim Crowley on board this afternoon. Still 4lb 'well-in' off his revised mark, Ian Williams' charge is 16/1 to repeat the trick and the handler wishes good fortune to anything that takes him on early doors for the lead. "Stars Over The Sea is an out-and-out galloper and it will take a good horse to take him on in the early stages - if something wants to go faster, good luck to them," Williams said. "We will have to see if he can successfully employ the same front-running tactics in this much bigger field."